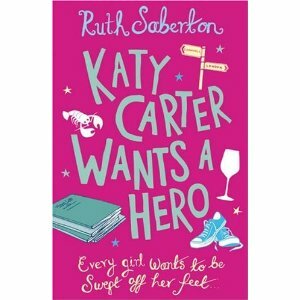 Katy Carter Wants a Hero by Ruth Saberton. A very fun, British,chick-lit book. 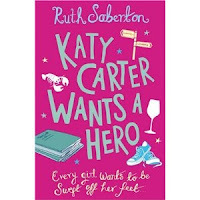 Katy Carter is a school teacher secretly dreaming of finding true love and also secretly working on a steamy romance novel. She thinks her life is on the fast-track finally, to happily ever after; engaged to the handsome hero of her dreams. Problem, her fiance doesn't seem to like her much these days. Katy is busy trying to please her fiance and squelch who she wants to be. Her story takes a very decided turn after a very important dinner party she is supposed to host to impress her fiance's boss. Problem: she is not a very good cook and not good at planning- enter her best guy friend to rescue her. Maybe. This story had quite a few twists and turns, most of them very silly fun. A few points were just out-and-out fantasy...but in a good way. Yes, we would all love to bump into a gorgeous movie start and be asked to be his girlfriend for the tabloid's sake...not going to happen, really- but this book is so much fun that you sit back, watch it all unfold and enjoy the ride. This book put a smile on my face, I couldn't put it down- wanting to see what crazy thing would happen next to Katy. This one will go on my fav list. Several adult situations, though pg I would say...and quite a bit adult language that would make it unsuitable for youngsters.